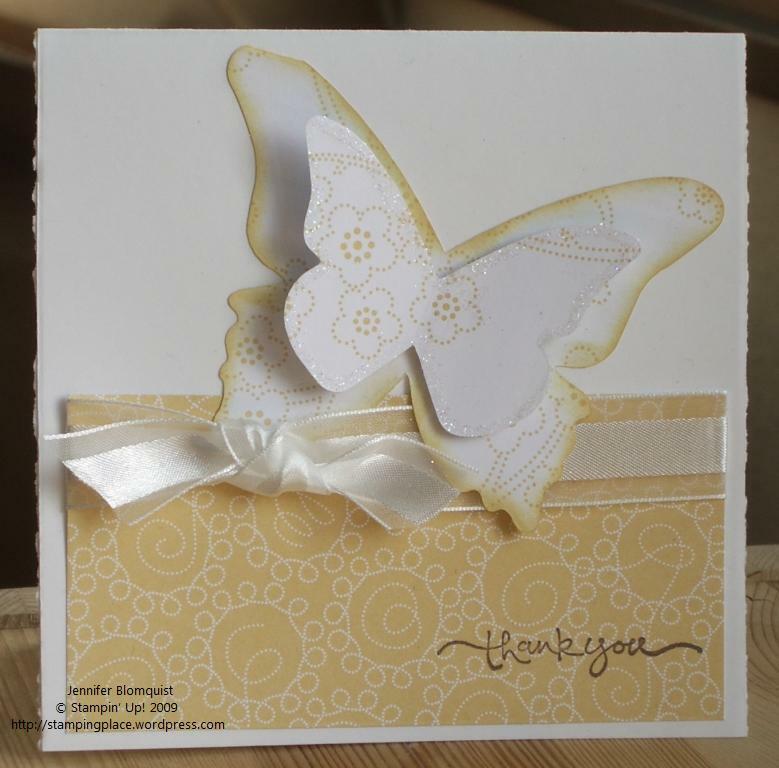 Its been a crazy week for me but I’ve finally managed to sneak away to get a quick card put together and up on the blog. This last week, I was away in Dallas on a business trip and returned home to my Mother-in-law visiting for a week. And while all of that is fun, I haven’t had much time to get some stamping in. But then yesterday, I had the perfect excuse to take time out of entertaining and get creative. My MIL was going to a wedding and didn’t want to spend $4 for a “nothing special” card from the store. So, we were going to make a card for her to take. So, while she was getting ready for the wedding, I started playing with some of my scraps to see what I could come up with. In this case, I had the flowers from my crystal effects technique night, the bow from the same night (we were discussing different ways to tie bows), and then scraps from the new SAB paper – delicate dots. 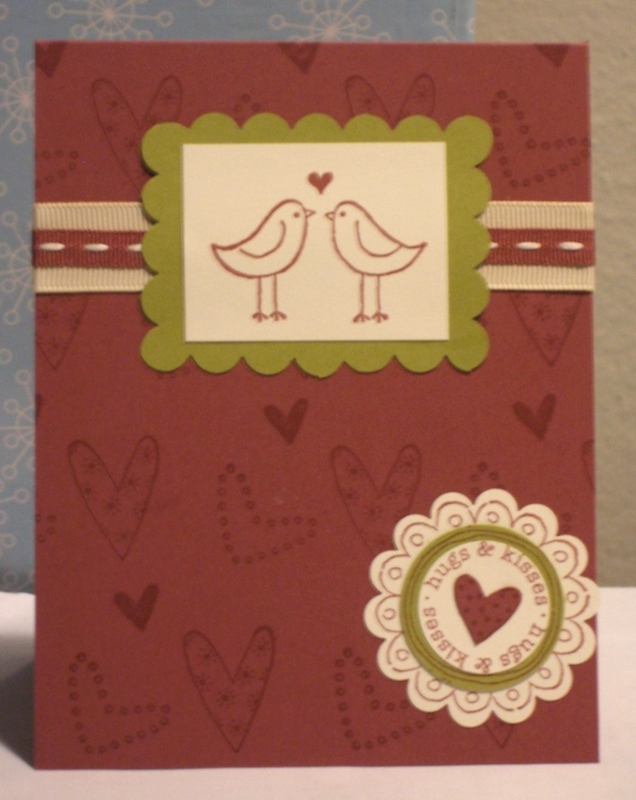 I only had about 15 min to come up with a layout and put it together so it is simpler than I might have done if I had more time, but it was nice to use some of my pieces into a simple, pretty card. 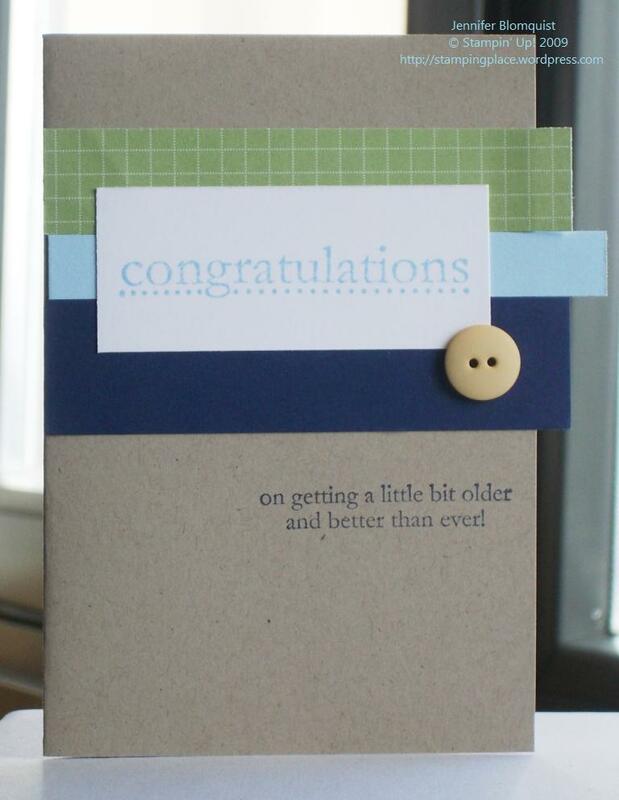 Inside the card, I stamped the Heard from the Heart sentiment “wishing you happiness today and always”. 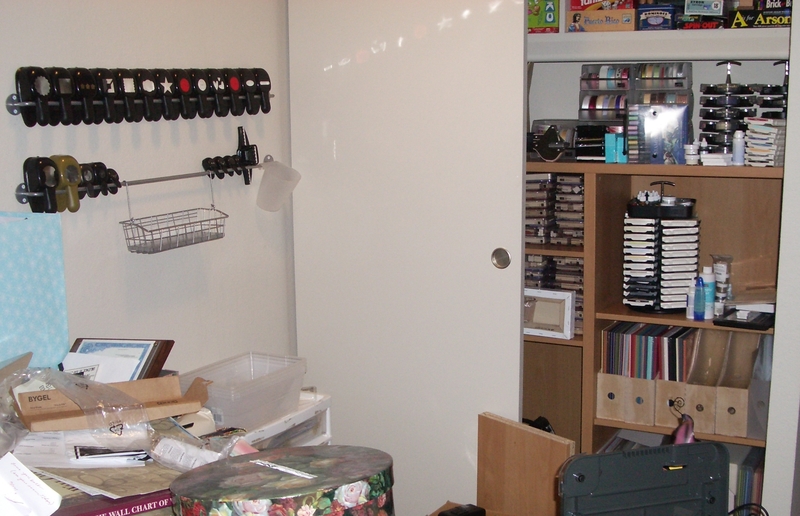 My other project I’ve started is getting my office cleaned up and turned into a craft room. My dining room has been great but my DH would rather I get set up in a slightly less public space. 🙂 So my MIL and I went to ikea and shopped for some fun organizational pieces and I hope to make good progress on this project over the next week. Having the pieces sitting in my house is pretty motivating for me to get it done. I’ll share pictures when i’m done. Hope you all are having a great week! Hope you all had a great Valentine’s Day weekend! I enjoyed some time with the DH at home on Saturday and then Sunday we drove up to Seattle to meet up with some friends and participate in a puzzle event (think, Amazing Race only with puzzles to tell you where to go next instead of envelopes). On the way north, we stopped by a fellow demonstrator’s open house. If you know Cristena Bagne, she is a super talented and very nice demo in the Puyallup, WA area and this was the first time I got to see her home and stamping space. 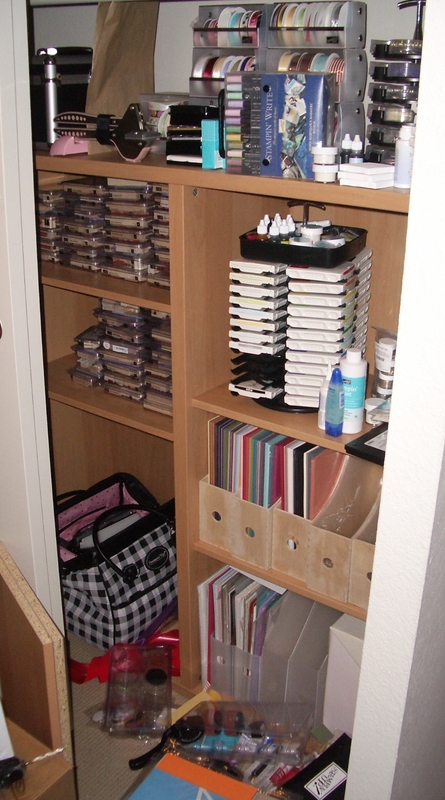 She is so organized and has an awesome stamping room. 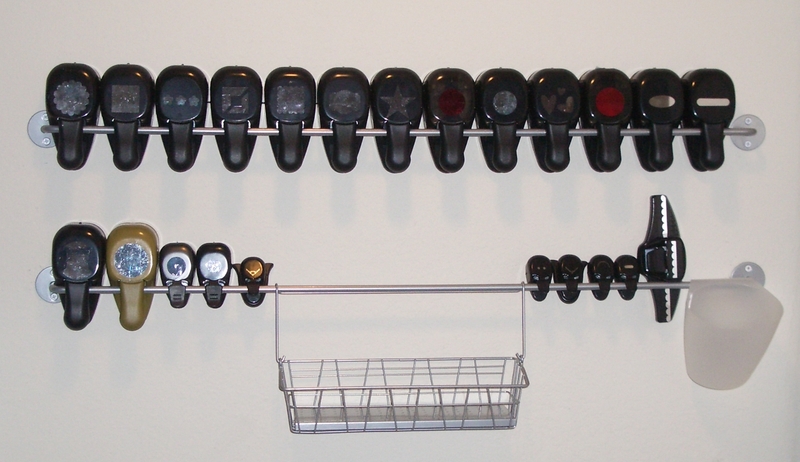 I now have some ideas for how to organize, if I can actually act on them. (Isn’t that always the hardest part). Well, as part of her open house, we did a couple make and takes. They were so cute I had to share them with you. And now I’m off to do some more stamping with friends. Don’t forget to let me know if you want a Designer Paper sampler! Happy Monday! Have a fantastic weekend and a wonderful Valentine’s Day! Get Your Own Stampin’ Up! 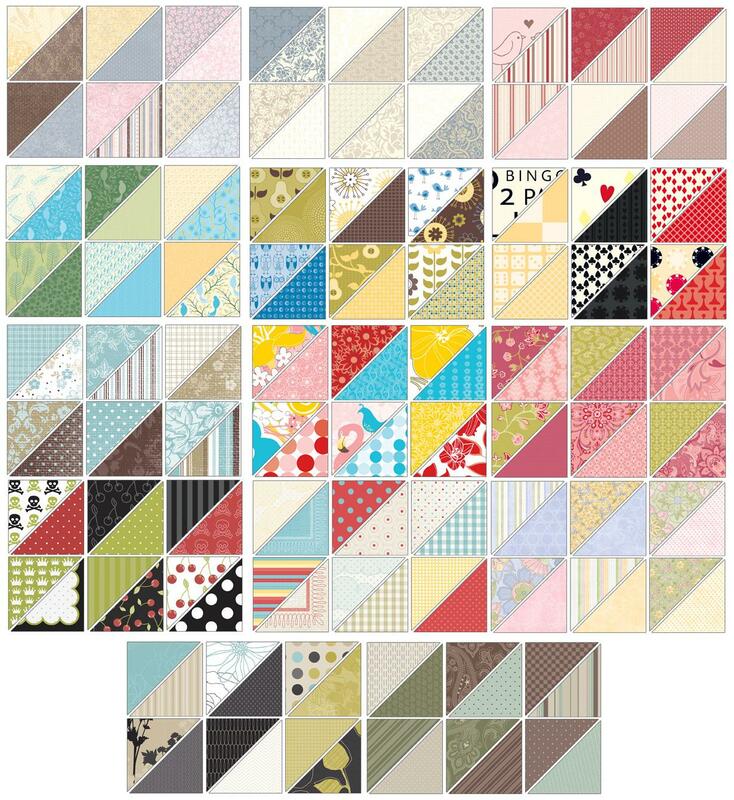 Designer Paper Sampler! I am putting together a Designer Paper share and offering it to all of my friends (new and old) out in the blog-o-sphere. So what do you get? You will receive one 6″ x 6″ sheet of each of the new Stampin’ Up! designer paper patterns. There are 14 new paper packs including specialty textured and glossy papers. That is 84 sheets of 6″ x 6″ paper in all! This would cost you over $150 if you were to purchase all the paper packs. Instead, for only $30, you get some of each and every new paper in a big enough piece to use for multiple projects. Plus, if you sign up for the Designer Paper share, all shipping within the US is free. Space is limited so contact me today to reserve your spot. So tonight was our Crystal Effects night, and I think everyone learned something new – myself included! I ended up staying up late last night as I kept finding new ways to use crystal effects that I wanted to try. If you haven’t heard of crystal effects, it is this great thick clear liquid laquer for using on craft projects. The most straightforward use is to add a bit of gloss or shine to your projects by applying some Crystal Effects on top of a stamped image. However, there are a ton of fun and creative other uses. Use crystal effects as a base for glitter. Drop some crystal effects onto a stamped image and then cover in glitter. Tap off excess glitter and allow to dry. Create Faux Brads by punching out a circle of paper and placing it over a glue dot. Add some crystal effects to the top and you are ready to go! 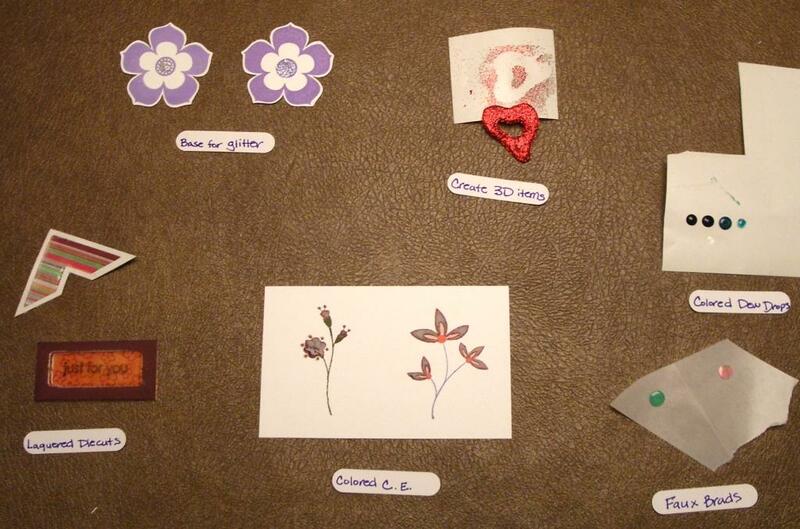 Create dew drops by dropping some crystal effects onto wax paper or the backing for the stickers from your stamp sets. Add a bit of reinker color to make different colored drops. Color with crystal effects by mixing some crystal effects and reinker, and then using a brush or toothpick, color in a stamped image for a colored, glossy effect. Make a 3D embellishment by drawing a shape with crystal effects on wax paper (or the sticker backing) and then pouring glitter on top. Allow to dry and then pop-off. Create laquered die cuts. Cut out a shape in chipboard (in my case, I cut out the left over piece from a chipboard die cut after I popped out the die cut). 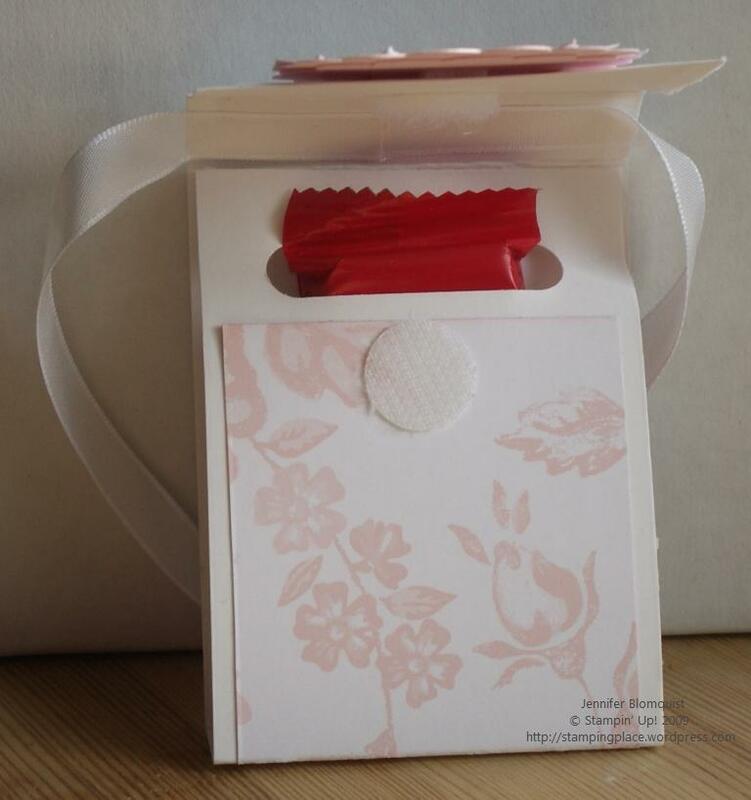 Glue the chipboard to a piece of designer paper. 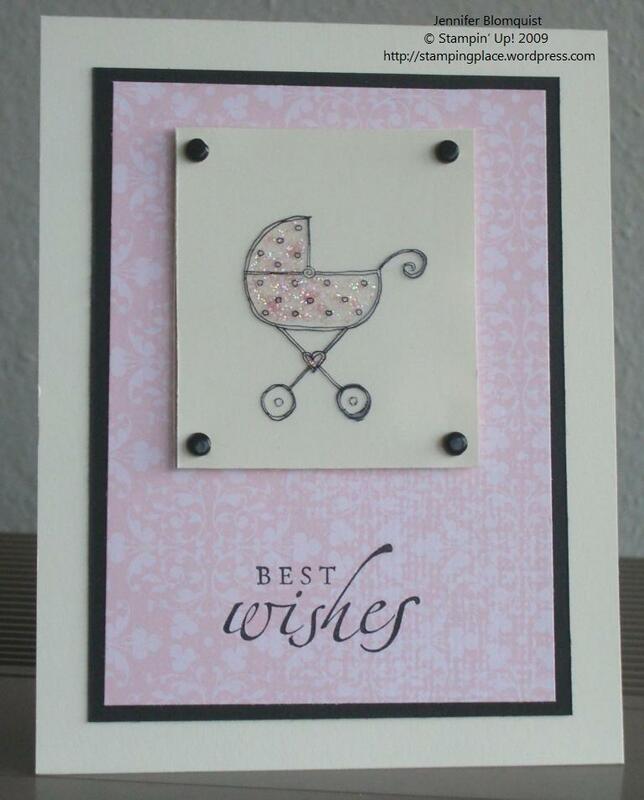 Fill in the die cut space with crystal effects and allow to dry. Make glittering transparencies. Mix some crystal effects with some reinker and dazzling diamonds. Use a paintbrush to apply the colored crystal effects to the backside of a stamped transparency. 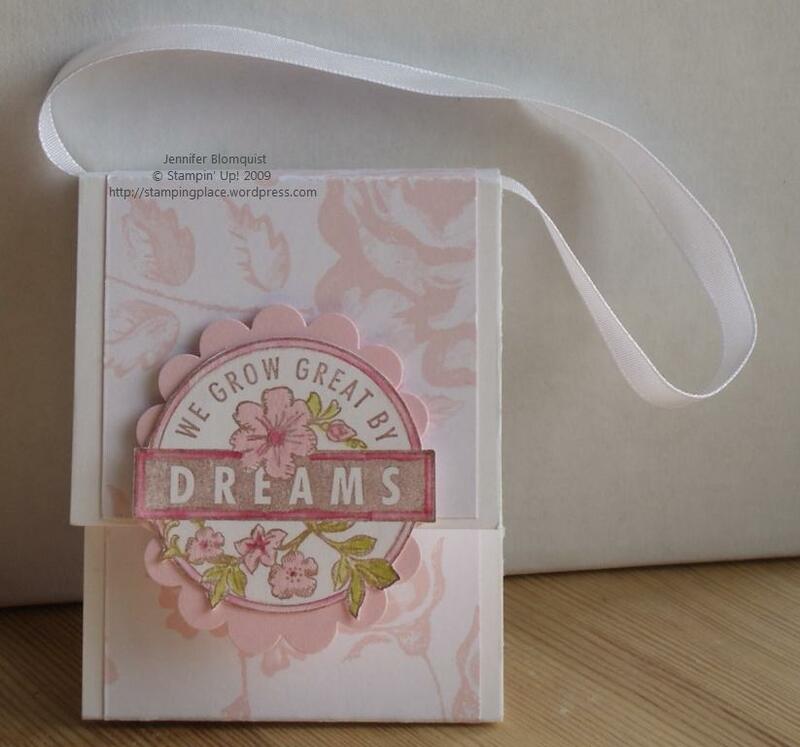 Allow to dry and attach to your card or project. This weekend was a lot of fun. I hosted an Open Scrap day at my home on Saturday. I had planned on sitting an working on my personal projects while the other ladies worked on their projects; but of course, I was way to social for that. 🙂 I was playing with my new BigShot, showing folks how to use it, and other fun techniques. So, it wasn’t until 5 of the 6 ladies had headed home that I finally sat down with my kitty scrapbook and started working. But it was fun to have 6 crafters over. So, I still have all my stuff out in hopes that I will make more progress on my scrapbook, but I have a feeling tonight will be filled with getting ready for my technique night tomorrow. Tomorrow we are playing with Crystal Effects and I’m really looking forward to it! 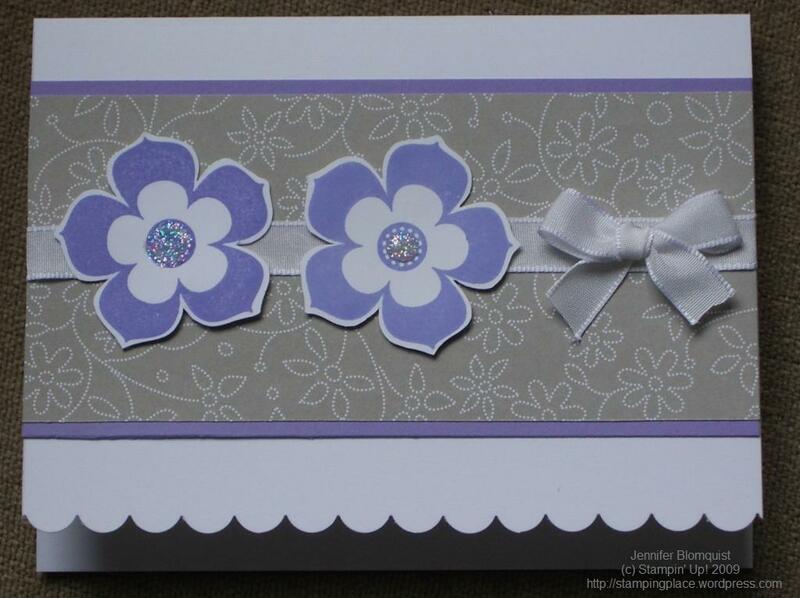 Here are the other two cards I made for my card kits for Saturday. These last two came together very quickly and have helped me be an even bigger fan of the SAB sets. Oh yeah, and the paper in the SAB catalog is so yummy!